Lot 1661, Jalan Industri Rembia 4, Kawasan Perindustrian Rembia, Mukim Sg. Petai, 78000 Alor Gajah, Melaka, Malaysia. SOLUTIONPACK MACHINERY (MALAYSIA) SDN BHD is a Manufacturer Solution Provider in providing professional custom make machines to our client. We have established in the market more than 10 years. We pride ourselves as being one of the preferred suppliers for most of the established and well-known manufacturers in local and global market such as Singapore, Vietnam, Thailand, Indonesia, Philippine, Taiwan, Middle East, Africa and etc. 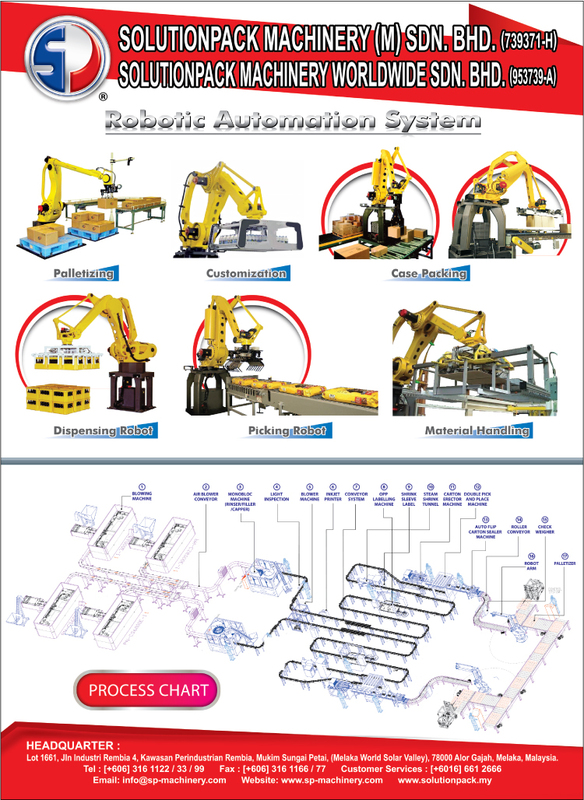 Solutionpack Machinery (M) Sdn Bhd has more than 100 staff working together in the company. We have structure our company into 4 departments, management, production, marketing and maintenance in making sure we able to commit ourselves to our client. To make sure we able to deliver in the global market, we have setup sales and service offices in different country. We are providing more than 100 types of food processing, packaging, filling machines and custom make machine. We have enough experience in manufacturing food, carbonated drinks, food processing, fruit juice, cordial, prawn crackers, tortillas, pop corn, ring snack, nuts & coffee roaster, rice snack and etc. Besides providing machine, we are always willing to share our experience and our knowledge to our clients. Client success is our success. "Made To Order" custom make machines is what we specialize on. We have put all the efforts in providing what our clients order. You Order, and We Make It! Our vision is expand and making our brand as Trusted Global Brand in customized machine for manufacturing and food processing. Our mission is making sure our clients get more than what they pay as we always believe our client satisfaction is more than anything.